Chelsea are reportedly among the clubs keeping an eye on the transfer situation of in-form Barcelona left-back Jordi Alba. The Spain international’s contract is due to expire at the end of next season, meaning the club surely need to tie him down to a new deal sooner rather than later. Alba looks a key part of how Barcelona play, and it’s little wonder there’s talk of big sides from the Premier League being keen to potentially pounce on his availability. Chelsea are listed as among those, along with Manchester United and Manchester City in a latest report from Diario Gol, and this is not the first time he’s been linked with a potential move to England. United were recently linked with the 29-year-old in a report from Don Balon, which stated the defender would likely cost around €50million. Neither team, in truth, looks in desperate need of a new left-back, despite Alba’s obvious quality, but Chelsea may perhaps feel he’d be enough of an upgrade on Marcos Alonso that it would be worth snapping him up as he could be available for a reduced fee. United could perhaps also do with another option alongside Luke Shaw, with Ashley Young the only current backup, and he looks more at home at right-back due to not being a natural left footer. 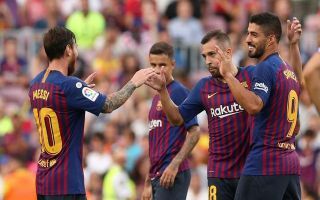 Barca should do all they can to keep Alba, however, with the attack-minded full-back linking up superbly with the team’s front three this season, picking up two goals and six assists in all competitions already. For a defender, that’s a superb return and one that would no doubt benefit many top Premier League sides if he did make his way to a top club in England.